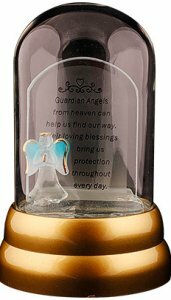 DIVINE CHRISTIAN GIFTS - Glass Dome Guardian Angel with Fibre Optic Lights. Glass Dome Guardian Angel with Fibre Optic Lights. Measures 5" and comes singly boxed with fibre optic light, batteries included.